New York City gets bragging rights for having the tallest building skyscraper in the U.S., beating out Chicago's Willis Tower, after a ruling that said that the 403-foot spire atop One World Trade Center is technically part of the structure. One World Trade Center — the marquee skyscraper that has spent more than a decade in development and construction amid great political debate — has claimed the mantle of tallest building in the country, staving off a challenge from Chicago's Willis (formerly Sears) Tower, an expert panel of architects has announced. The Council on Tall Buildings and Urban Habitat, the official arbiters of all things architectural, said Tuesday that the 408-foot antenna atop 1 WTC counts toward the building's full height. Reaching for the sky, these buildings and towers compete for the world's attention. The decision settles a flurry of debate over whether the spire was integral to the structure's design. The organization does not count "antennae, signage, (or) flag poles" toward buildings' officials heights. Without the needle, the building stands at a 1,368 feet — rivaling but not eclipsing Willis Tower's 1,451 feet. 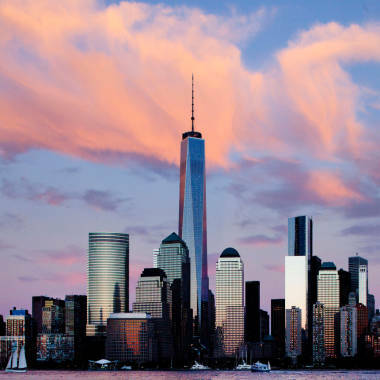 Speaking just blocks from the World Trade Center, the council's chairman, Timothy Johnson, said the decision was unanimous among its 25 members. "It was very clear that it was a spire and not an antenna" at the top of 1 WTC and qualifies as "part of the architectural expression of the building," said Johnson, a partner at global architecture firm NBBJ. The announcement caps a decade of development and debate around the skyscraper at the World Trade Center, the site of the Sept. 11, 2001, terror attacks. A year after the attacks, former New York Gov. George Pataki announced that the new structure would rise to a symbolic 1,776 feet. 1 WTC's design went through various fits and starts over the last decade. At one point, an antenna was added that would have vaulted the building’s height to over 2,000 feet, making it the world’s tallest at the time. According to the Council on Tall Buildings and Urban Habitat New York's One World Trade Center tower has officially topped Chicago's Willis Tower, by a spire, as the tallest building in the United States and the Western hemisphere. A ceremonial cornerstone was laid on July 4, 2004, years before any concrete was poured and when the building was still known as the Freedom Tower. Blueprints changed several more times in the ensuing years before construction began in earnest in 2006. All along, the officials, architects and developers involved in the politically-charged project maintained that the building would, at the very least, be tallest in the country — and therefore, the hemisphere. But a little-noticed move in 2012 — the developer's decision to scrap the decorative sheathing that would have made the mast integral to the building's design and therefore an unequivocal "spire" — prompted uncertainty over whether the building could still claim the mantle of tallest in the U.S. The design change would have saved $20 million on a $4 billion structure. Rivalry notwithstanding, Willis Tower and 1 WTC are dwarfed by other skyscrapers around the globe. The Burj Khalifa in Dubai, current titleholder for world’s tallest, soars for another 941 feet from the top of 1 WTC’s spire. Another building under construction in Saudi Arabia is set to stand taller than both buildings if they were stacked on top of one another. One World Trade Center is expected to open next year with publishing giant Conde Nast as its main tenant. NBC News' Daniel Arkin and The Associated Press contributed to this report. New York City may have the country's tallest building, but that hasn't dented Chicago pride. NBC's Kevin Tibbles and Katy Tur debate the merits of their respective cities.